New Delhi (Sputnik) — The Hindu festivity of honoring the warrior goddess "Durga," who is believed to have killed the demon "Mahisashura" after nine days of one-on-one battle and also the re-enacting of the mythological epic Ramayana, has approached its pinnacle in India with people flocking to temples, religious fairs and sacred sites and markets in their full glory, decked to welcome the revelers. "Navratri," meaning nine nights, is followed by the festival of Dussehra on the tenth day and has two important legends associated with it. While east India celebrates the nine days as Navratri, honoring the warrior Goddess Durga, north India gets soaked in the nine nights of theatrical performance depicting the epic legend of Ramayana. The story depicts Hindu God Ram and his endeavor to save his wife Sita from the demon king Ravana. The tenth day of the festive season is called Dussehra, in which Lord Ram is believed to have killed Ravana. 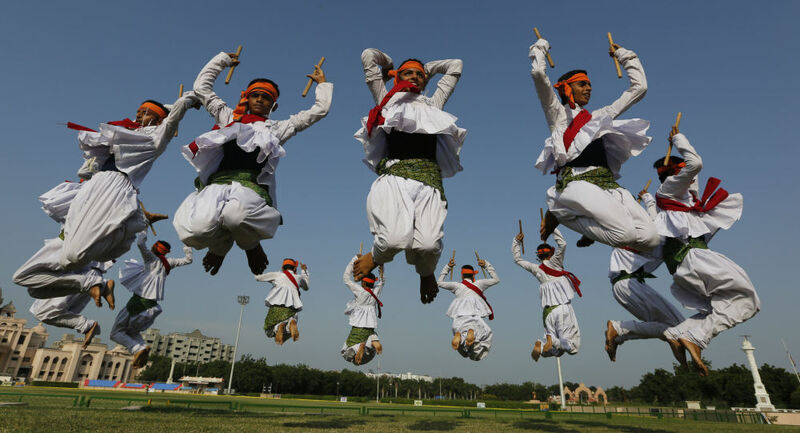 Western India breaks into nine nights of "Garba" dance as part of the celebration of the triumph of good over evil. Women dressed in their traditional attire dance in circles in unmatched synchrony with popular and devotional beats and music during the nine days of the Navratri festivity which symbolizes the sacred feminine and warrior energy embodied by the Goddess Durga. A feminine deity figure dressed in red and glittering ornaments in all fury and anger is installed in the middle of the dancing complex around which the devotees go around in whirling performance. The goddess Durga is depicted killing demons with a spear to denote the victory of good over evil. The culminating day of the festivity is the tenth day, known as "Dussehra," which is the day when the countrywide celebration and theatrical enactment of Ramayana is brought to a conclusion with the burning of the effigy of devil king Ravana to mark his killing. The story again marks the victory of good over evil. ​In some parts of the country, the day of Dussehra marks the worshipping of arms and ammunition among the warrior tribes. South Indians prefer to initiate the introduction of alphabets to their kids on this day.